The main thing that separates West Virginia and Ohio is the river. I always find it fascinating when we are driving from West Virginia side and get to enjoy the view at Ohio side. See on the first photo, we are on the West Virginia side and looking on the second photos is the Ohio side. Just a quick update here folks before I hit the hay. Have a great weekend everyone! I can't believe how much you can save for the classic mk4 at musicians friend. That's one great thing about Black Friday sale, you get to buy the things that you need or want for a lot cheaper than it's original price. Just like this DJ console, you can save over a hundred bucks by buying it now. No wonder people really go out during Black Friday for bargain hunting. Too bad I am not one of them lol. I have always wanted to be close to the ocean, close with the sea mammals, the dolphins and various other sea creatures that lives under the sea and are hardly seen, until and unless you go out into the sea, which does not keep happening. So, I along with my friends suddenly had the idea of going to the famous Seaworld in Florida. We fixed a nice summer week for the trip. The Florida vacation package booked through LavishCoupons.com made everything so easy for us by guiding and helping us step by step, from airfare to hotel and the tickets to the Seaworld Orlando. Promotional offers & discounts offered by LavishCoupons.com helped us save on our budget, view website for more details. The hotel was quiet cozy, but we hardly wanted to stay there for long. We were eagerly waiting to visit the Seaworld when our guide asked us to get ready. We were excited. We were taken away in a large deluxe bus from our hotel room. On the way to the Seaworld Orlando we saw many advertisements of the same, and our excitement grew bigger as we were nearing the place. Finally we arrived, and since we already had the tickets we didn’t delay. Unlike other theme parks, Seaworld Orlando is not divided into special theme sections; instead there were individually themed attractions like the Main entrance which featured Florida-inspired lush tropical landscaping with artificial freshwater marina and lighthouse. The Key West at Seaworld has been designed to mimic the appearance of the Key West city, where various animal exhibits like cownose rays, southern stingrays, green sea turtles greater flamingos, Indian manatees, and many more were to be seen. There were many attractions and rides like the Kraken-a floorless roller coaster, Manta-the flying roller coaster, The Sky Tower-400 foot rotating Gyro tower, Jazzy Jellies- A balloon tower styled ride that lifts up and spins, Ocean Commotion, The Flying Fiddler, and many more. However the main attractions were the Huge Shamu Stadium which is the 7-million-gallon home to the park’s killer whales to perform on the seasonal Shamu Rocks, The Whale and Dolphin Stadium featuring dolphins and macaws, The Sea Lion and Otter stadium, The Seafire Inn, The Bayside Stadium and plenty others to enjoy. Finally after a long day of watching almost all the events and riding the thrill some rides, it was time for us to head back to our hotels. We wanted to stay for long but, still the memory of such a day will not be rubbed at any time. The little miss wrote this on Monday night before she went to bed. I thought that it was very sweet. Whenever my kids starts to complain for things, I always remind them of how lucky they are. They may not have all the material things that they want but they are blessed with people that love them dearly. When we are eating and they seem to ignore the food that they have, I would tell them that there are so many kids starving at the moment and would gladly take even just a bite of their food. Sometimes, real life situation is what you need to tell your kids to motivate them to do good things. Inspired of what his sister have wrote, the little mister also tried to jot down his thoughts for Thanksgiving. He used the iPad in writing his notes. Peer pressure is already setting in to these young minds. They tell us things that their classmates has and when they don't have it, I ask them if they need it and if they say "not really" that's when I tell them that it's the reason why we don't get it because they don't really need it. Having stuff is nice but sometimes it spoils kids and when they get used to it, it is hard to say no when they ask for something. Unless of course, if you have unlimited supply of resources. For an average family like ours, we need to prioritize the things that we really need and set aside the wants. Anyway, I would like to take this opportunity to thank all of you for being part of my virtual life! Happy Thanksgiving to all! Meet Our Lil' Rock Star! When my son was around 3 to 4 years old, he love to strum his toy guitar. He would always tell us that he wants to be a rock star someday. It always reminds me of my grandfather who knows how to play instruments. I always admire his talent because he could play different kinds. My father never got that trait but his brothers knows really well how to play guitar just like my grandpa. I remember vividly how my grandfather took care of his instrument very carefully. He did not have one of those fancy SKB Cases but he has a special place in their hpouse where he store all his music instruments. Presenting our Lil' Rock Star! Thank You World for your Support to the Filipino People! It breaks my heart to see the aftermath news about the victims of typhoon Haiyan. It brings back personal experience just like this years ago when our town was hit by the super typhoon Sisang and swept away everything. The only thing left was the clothes in our bodies. Everything was gone, wiped away by tidal waves. It hurts, it's painful but I am grateful that the world cares and that they extend their helping hands to the Filipino people. we will get through, thanks you! In behalf of the Filipino people, thank you all for your continued support and prayers! May God continue to bless us all the strength that we need to start over again. To our kababayan back home, you are in our prayers! One of our long term goal is to have our kitchen renovated. Everything about it is outdated, the floor, the sink, and the cabinet. My husband wants to have a new kitchen cabinets that is functional and easy to organize your stuff. 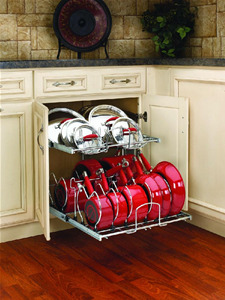 I found this kitchen cabinet organizers online and really love it. Our neighbor has recently renovated their kitchen and they have the same pull out organizer features in their cabinet. I really love that. This would be so nice to have. My husband always find it hard to get the pot or pan that he needs as we have so many and keeping it organized is a lot harder without a systematic organizer. One of my favorite hobbies when I was still in the Philippines was to collect different kinds of mugs. In fact I brought some of those with me when I migrated here in the States. The most favorite ones that I have are the mugs that was personalized with me and my husband's picture hehehe. When I came here in the US I brought with me my phone because it had a roaming feature. I used it in communicating with my family and friends. I did give it up however after months of using it because the card got so expensive and I found a way where I can still communicate for free. Well it was free for me but the one texting me back get charge for their replies but it was still cheaper compared to having a roaming phone. Anyway, there is a new app that you can use, the free SMS Philippines. You can use the app to send free SMS to Globe Telecom free, SMS to Smart Communications, and free SMS to Sun Cellular. You can send SMS without registering even which I really love. I immediately sent messages to my sisters to test the app. I was hoping that there would be a way to know if they get it or not but I couldn't find a description that says that instead I find this widget that you can try. If you click the down cursor below, you will find the list of unicodes m then just add the number you are sending the messages and voila, you're done. Once your message is successfully sent, you will get the pop up message that confirms it. So try it out!. This is a great app for Filipinos abroad especially this Christmas season. You will be able to get in touch with family and friends by sending free messages. So come on and try it, it's free! Just please remember that you can not replace your phone with this so don't rely on this for emergencies. IT is stil a good app for us Filipinos abroad so thank you Askimoi! Christmas is a great time of year to show how much you care by buying gifts for your friends and loved ones. If it is a surprise then you will get a lot more enjoyment out of giving them the gift, but how do you keep people from seeing the gifts before the big day? Here are 5 great places to hide Christmas gifts until you are ready to give them. Hiding them at your own house might seem like risky business, especially if you have older children who like to snoop around and try and find out what their presents are early. If you have a good friend or family member who has some spare space why not ask them if you can store the presents there and collect them just before Christmas. If the items are larger items then you will definitely not want to risk having them at home where the kids or other family member might stumble upon them and ruin the surprise. One great way to ensure that the Christmas presents stay hidden until Christmas is to put them on layby and pick them up just before Christmas. Not only will it mean that they are kept as a surprise but you will be able to pay them off gradually which will be better on the hip pocket, and will give you a chance to choose things that you really want to get the kids. Another great advantage of doing it this way is that you will know that the gifts are kept safe and secure in the shop, and if they are damaged before Christmas it’s not your problem. If you have particularly large gifts, or even a large number of gifts and want to keep things really secret why not hire a storage unit. If you already have a storage unit then it won’t take too much trouble to just add a couple more things to the room. There are storage units of different sizes available at different storage places so you are bound to find something that works for you and is in your price range. Check out http://www.fortknoxstorage.com.au/ for a storage place near you. Storing things at home might be a risky business, but if you have a garage that you already store things in then it might be easy for you to hide the Christmas presents among the rest of the stuff. Often the kids might not think to look in the garage because they are used to seeing stuff in there, and your presents will remain a secret until the big day. If you have a big wardrobe, or even a shelf up high from little grabbing hands then this might be a good place to store the pressies so little people don’t find them. Again if you have older children who like to explore then they might find them, but if you hide them well you may just get away with it.